Now with 15% (54) more wipes! 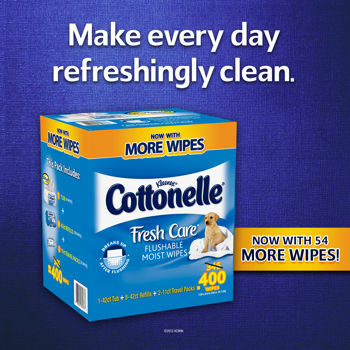 Cottonelle Fresh Care Flushable Moist Wipes leave you feeling cleaner and fresher than toilet paper alone. These soft wipes contain just the right amount of moisture to provide the ultimate clean. Pair with toilet paper to feel your cleanest and freshest every day. Great for the entire family. Ingredients: Water, Sodium Chloride, Sodium Benzoate, Polysorbate 20, Sodium Lauryl Glucose Carboxylate, Lauryl Glucoside, Malic Acid, Fragrance, Methylisothiazolinone, Aloe Barbadensis Leaf Juice, Propylene Glycol, Tocopheryl Acetate.